Spring is sprung, which makes this gardener frisky. 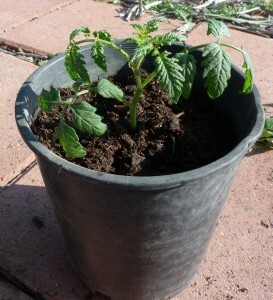 Thursday was such a gorgeous warm day, late that afternoon I went out to pot up all my newly acquired tomato plants. That’s when all hell broke loose. I had on shorts and a sleeveless shirt. 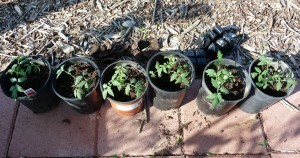 Frankly, I was a bit hot as I started on the tomatoes. Silly me, this is Texas and anything can happen. And boy, did it. The wind kicked up and the temperature dropped 25 degrees in the hour it took me to work on my plants. The photos may be a bit blurry because it’s hard to take photos of plants with 25 – 40 mph winds! Oh well, let’s dig in, shall we? 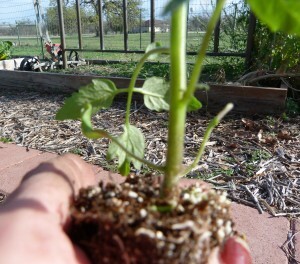 I am from the “do it on a shoestring” gardening school. I bought a 6 pack of Celebrity tomatoes for $2.29. They are really small. 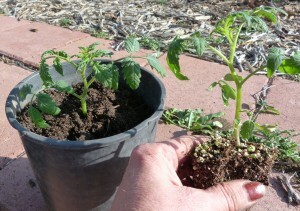 To give them a great start in the garden, I “pot them up.” I take each little plant, give it some attention and then plant it in a one gallon bucket. 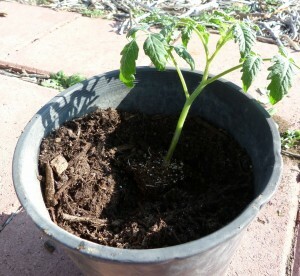 For the next few weeks, I water and take care of the tomatoes just like I would if they were in the ground. This has two advantages: it makes them grow large faster and if we get an unexpected late freeze, I can run them all in the garage. Lessons learned from disasters past. Why don’t I just throw this in the pot? Because I know a great gardening secret. If you remove the bottom leaves and plant it low in the pot, those lower leaves will produce more roots, making the plant stronger. See the smaller stems at the bottom? Gently break them off with your fingernails or clippers if you are fingernail-less. See the tiny notches where the leaves were? That’s what turns into more roots. Push it down as deep as you can, though don’t let the lowest leaves touch the dirt. That is an invitation for disease because the water hits them and bugs love moisture. 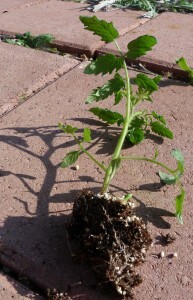 That tomato plant looks bigger already, doesn’t it? Let’s review one more time. 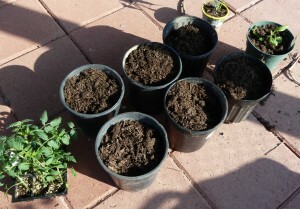 We’ll repeat this process when I plant them in the ground, but that’s for another blog. A note about tomato selection. If you’re a grab it off the vine and eat it tomato person, you’ll probably want to plant Celebrities or any of the tomatoes with Fire, Sun, or Heat in their names. This means they will keep producing after it’s above 92 degrees, which doesn’t take long in Texas. I don’t eat raw tomatoes, so this year I chose Celebrities and Romas. 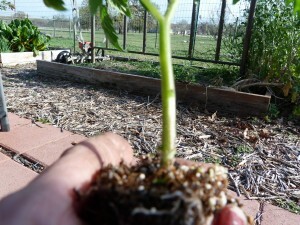 Roma’s have very few seeds and are much easier to deal with when you are making Tomato Basil Spaghetti Sauce, (see the recipe under Recipes to Diet For) which is what I do with the majority of my tomatoes. I also bought some Sugary Grape Tomatoes because those are good roasted and tossed into salads. One last thing. Remember the Magical Eggplant Bush? Well I was at the store and found three little, lousy eggplants. 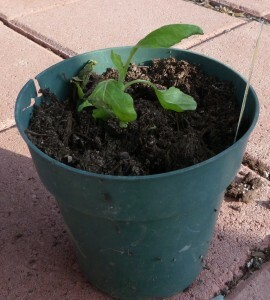 I took the worst of the bunch, potted him up and told him he had a great deal to live up to. We’ll see what happens. Spreading gardening throughout the world…one tip at a time.